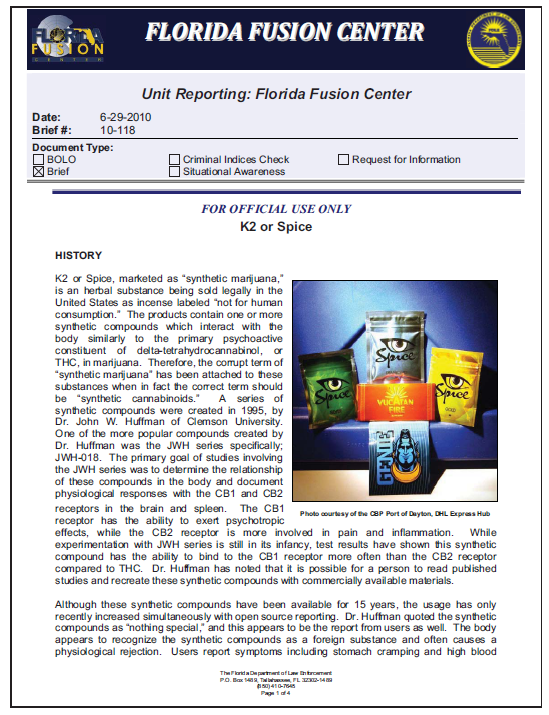 K2 or Spice, marketed as “synthetic marijuana,” is an herbal substance being sold legally in the United States as incense labeled “not for human consumption.” The products contain one or more synthetic compounds which interact with the body similarly to the primary psychoactive constituent of delta-tetrahydrocannabinol, or THC, in marijuana. Therefore, the corrupt term of “synthetic marijuana” has been attached to these substances when in fact the correct term should be “synthetic cannabinoids.” A series of synthetic compounds were created in 1995, by Dr. John W. Huffman of Clemson University. One of the more popular compounds created by Dr. Huffman was the JWH series specifically; JWH-018. The primary goal of studies involving the JWH series was to determine the relationship of these compounds in the body and document physiological responses with the CB1 and CB2 receptors in the brain and spleen. The CB1 receptor has the ability to exert psychotropic effects, while the CB2 receptor is more involved in pain and inflammation. While experimentation with JWH series is still in its infancy, test results have shown this synthetic compound has the ability to bind to the CB1 receptor more often than the CB2 receptor compared to THC. Dr. Huffman has noted that it is possible for a person to read published studies and recreate these synthetic compounds with commercially available materials. Currently, one of the more popular websites to purchase K2 is www.k2incense.org, which is based in Hong Kong. The website contains the disclaimer their incense is not for human consumption, although they offer to ship the material prerolled in a smokable form. In addition, these products can be obtained from a variety of sources to include local smoke or “head shops.” Businesses or individuals are able to purchase packages with a variety of K2 substances, each with differing chemical compounds. K2 can be purchased for as little as $8 per gram online, with the presence of active substances such as JWH-018 ranging from three to twenty milligrams. Usually, the material is sold in a minimum of three-gram baggies for a retail sale price of $35. K2 is readily available since a multitude of synthetic chemicals can be sprayed on a variety of leaves and be marketed as a substitute for marijuana. In addition to online prepackaged K2, powdered forms of synthetic cannabinoids, like JWH-018, are available for online purchase as well. The availability of powdered material allows anyone to create their own K2, which makes the dosage and chemical structure even more unpredictable. With the misconception that Spice is a marijuana substitute, persons are smoking the substance with the assumption the effects will mimic marijuana. The synthetic compound merely binds to the same neurological receptors as THC, but does not cause the same physiological and psychological effects. Once users experience the false psychological effects, averaging 30 minutes in duration, they may also experience unpleasant physiological effects. Due to this unequal experience, there do not seem to be a large number of repeat users, as reflected in online open source reporting, including www.erowid.org which cautions readers not to use the substance.